It’s not every day that I get to test an a11y app, that later became into a product. Google recently launched two apps to make the life of people who are deaf or hard of hearing easier: Live Transcribe and Sound Amplifier. I am a fan of Live Transcribe in particular. The apps listens to your call or the surroundings of your phone and generates captions automatically. It works with even several languages. I had the honor of testing it early and I am happy with the result. I hope it does a good job for you too. At the end of last year, I attended theDeafIT conference in Munich. This is my report about this awesome conference. The DeafIT conference is targeted towards IT professional who are deaf or hard of hearing. From what I heard during the conference, there are two main goals of the event. One is to enable deaf IT professionals to network among each other and with potential employers. The other one is to make IT content and knowledge accessible to them (which is not necessarily the case on other IT conferences). DeafIT started small, as a tiny conference back then in 2013 in Munich. In 2018 they celebrated their 5th anniversary, which included a nice gala dinner program in the evening in the rather fancy conference hotel. While the conference is called DeafIT, the audience is mixed with respect to the level of hearing loss. Besides the Deaf, also hearing and hard of hearing people are welcome as speakers and audience. However, those latter two groups were in the minority in this event. This led to the – for me – very interesting experience of being in a room of ~100 people and everyone is talking, but you still barely hear a sound. I often feel being in the minority among hearing people, but this time I was in the minority in a different way. I heart about this conference a few years back already, but so far I had been rather hesitant to attend. Mostly because I am not deaf (yet?) and as such not part of the deaf community. While there was no indication of this on the conference page, I was just not sure whether I was welcome there (which turns out, was complete nonsense). While I am hard of hearing and that at a profound level, I would not even call myself part of the community of hard of hearing people, mainly because I lost my hearing rather late (in my late 20ies) and never actively sought out the community by attending meetups etc. Nevertheless I am somewhat active in the media with respect to hearing loss, one example being this very blog. Over the years, I have build up a network of people who are hard of hearing or professionals in that area. And those send me links to the DeafIT conference a couple of times. After my initial hesitation and in particular when I learned that 2018’s conference will take place in Munich, I thought I would give it a try. And it was totally worth it. When entering the conference room, the first thing you notice is the highly sophisticated technical setup. The room is equipped to accommodate the needs of speakers and attendees who are hearing, hard of hearing, or deaf. That means for speakers presenting in German sign language, a translator was sitting in the first row, speaking what they read into a microphone in German spoken language. Some signing speakers did not sign in German sign language, but in their respective mother tongue, which in this case was Russian and Brazilian. Also here, a translator was able to read the foreign sign languages an simultaneously translated it into German spoken language. Additionally for the people in the audience who communicate in German sign language, a second translator would be located on stage and simultaneously sign the content in German sign language. When a presenter was presenting in spoken language, a sign language translator would accommodate them on state and translate simultaneously into German sign language as well. Before I attended this event, it never occurred to me that in this setup, when you want to ask a question in sign language, you actually have to go on stage, because otherwise the audience would not be able to read you. Additionally, a remote captioning service was used during the talks (provided by Verbavoice). That means somewhere else on the globe somebody was listening in on the audio stream of the conference and typing the spoken words really really fast. These live subtitles were projected on the canvas below the presentation’s slides. Last but not least, there was an additional service for the hard of hearing. If you were wearing hearing aids with a T-coil, could you borrow receivers to connect your hearing aids directly to the audio stream. I could have used that, but the crystal clear audio signal from the speakers together with the live captions covered everything I needed. I was really overwhelmed by the effort this small community makes to include everyone. While I was here in a minority among people whose primary language is sign language, I felt a lot more welcome than I usually feel among the hearing. I wish other IT conferences would have the willingness to include people as much as DeafIT does. The conference program consisted of one track of presentations about various areas of IT. The key note started at 8:45 and everyone was up and running at that time already. While I was still trying to wake up with a coffee I was wondering if being an early bird is somehow related to hearing loss or whether they just started so early, because the agenda was so packed. While the program covered a lot of general IT topics ranging from web development to IT security, a large part of the talks were related to sign language or hearing loss. Some of the general talks were really interesting, but the ones related to hearing and signing were the most interesting to me. I guess mostly, because I do attend other IT conferences as well and those never tend to cover these topics. You can find the entire schedule here and the slides for download here and the official report here. This was a summary of a PhD thesis where the author used machine learning to recognize (one-hand) signs and created a system that would translate them simultaneously into a sign transcript language. He had a very impressive demo where he would form different gestures with one hand and the computer would translate them immediately and correctly. Hugo is a cute little avatar and the face of an app, which helps to translate spoken or written language into sign language. It is developed in Brasil, primarily for Brazilian sign language. In Brasil, illiteracy is higher than in Europe for example, in particular among the deaf, where many people never study a spoken language in their life. This was not a presentation, but a panel discussion with a couple of the speakers of the conference. The chances of AI for the Deaf community were rather easy to understand, like all the cool projects which use machine learning to translate sign language, sign transcriptions, spoken language and written language into each other. What I found more eye-opening were the risks. So far it did not occur to me that technology that relies on the ability of speaking and proper grammar are not necessarily accessible to the Deaf. This includes Siri and Alexa, which are trained on hearing people’s voices and grammar and hence fail when addressed by someone whose voice or grammar deviates too much from the hearing majority. The understandable fear of the community here is that these technologies will spread to all areas of life and others might be deprecated in favor of them. Imagine a doctor’s office where you can only make appointments by talking to a speech bot, which does not understand you. I really loved this conference. The people where awesome, the talks were interesting. I regret not at all having to get up at 6m to get there on time. I learned a lot about the community, sign language and some stuff about IT as well. I felt welcome and included and despite the packed agenda, I for once was not totally exhausted after attending talks for eight hours straight. I wish more conferences would be like that. For a while now, I am member of a Facebook group “Hearing Hacks“. I encourage everyone interested in the topic to join there. It is an active group sharing lots of interesting content. Enjoy! To my delight, I found out that my 28c3 talk was recently linked from an article on heise.de (which is the German slashdot). I love to see that by now there are projects pursuing what I was calling for in my talk. That hearing aid hardware and software development becomes more open and accessible to every geek out there. Excellent article that very much resonates with me. Frank at some point faced hearing loss, got hearing aids and then took it from here. Today he can hear Wifi-signals. Interesting podcast about him and other people who turned their disability into some crazy ability. Not about hearing, but nice story about a little girl who gets an ear prothesis 3D-printed. An application that might make hearing aids popular among the general public: in-ear piece that does real-time language translations. Love this article about a lady ‘modding’ hearing aids to look pretty. Nothing to be ashamed of! Have you ever wondered how sign language works in a technical environment? What if there is no sign for “DDOS attack”? This article tells you (unfortunately only in German). Finally a plan to transmit train station announcements to hearing aids (article in German). Oticon introduces first product using “IfThisThenThat” protocol, opening up the market for interesting applications, such as notifying your family when your ears need new batteries (article in German). Olive: an Indiegogo project to produce affordable hearing aids. I have been rather silent these days. I don’t do much actively in the field of hearing and acoustics. But I do follow the media and once in a while I stumble upon interesting articles that I like to share with you. http://www.acoular.org/ Acoular seems to be a neat sofware suite to analyse audio data. Hearing aids are on the verge of becoming lifestyle gadgets, such as the company Soundhawk shows. Here’s an article in “Die Zeit” about it (German only). Interesting TED talk about how sound affects us. Interview with author Alexander Goersdorf about living with hearing loss (German only). Chaos Radio Express (Podcast) about the ear (German). hearinglikeme, a community blog of hearing aid manufacturer Phonak. Another wonderful TED talk, this time about that architects should use their ears. I guess going to restaurants would be a lot less frustrating for us if they did. A joint venture of hearing aid of a manufacturer and a wearables company? I am looking forward to what comes out of that. Hackers used hearing aids to listen to WIFI signals. An article about apps to provide captions when watching movies in a cinema. I wish that this would work better, but at least it is a start. The maker scene blesses us with bracelets inspired by sound waves. What a cute idea. 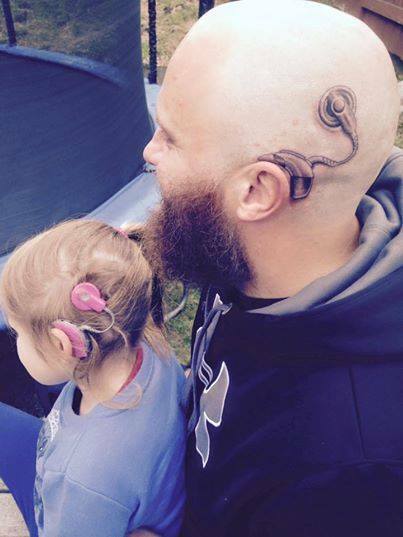 Parenting done right: father tatoos a cochlear implant on his head in solidarity with his kid. Finnish geek girl carries out a very well done analysis of her own tinnitus. That’s one groovy sign language translator. The German youth book “Freak City” will be made into a movie. The book tells the story of teenage love between a deaf girl and a hearing boy. If you haven’t read it, I do recommend it. It is also enjoyable if you have grown out of the teenage age already. Comedian D.J. is the only comedian I know of that talks about his hearing loss in his show. I attended the 32c3 last year and watched the talk “Unpatchable“, a talk which is related to hacking medical devices. In this case it wasn’t hearing aids, but pacemakers. Interestingly, the speakers raised similar questions as I did in my talk at 28c3. This device is part of my body, why do I not know what code is in it? How can I trust that the device is not vulnerable from the outside? Does a doctor have to tell me when he flashes the firmware or that the device is tracking my very personal data? Agreeable, the consequences for patients wearing pace makers are more impactful than for patients wearing hearing aids or cochlear implants. However, I still found the talk worth watching, I hope you do too. My beloved employer is sponsoring scholarships again. As in the last years, there is one dedicated for students with disabilities. If you are a student which has a hearing impairment or know other students which have, please point them to this page. It has been silent around here, but that does not mean other people don’t to awesome things in the hearing aid world. I’d like to point everyone of you to a slack chat/forum to discuss hearing aids technology and hacks around it.